A spacious and attractive three or four bedroomed Detached Bungalow set in an elevated position close to the Bedale town centre. 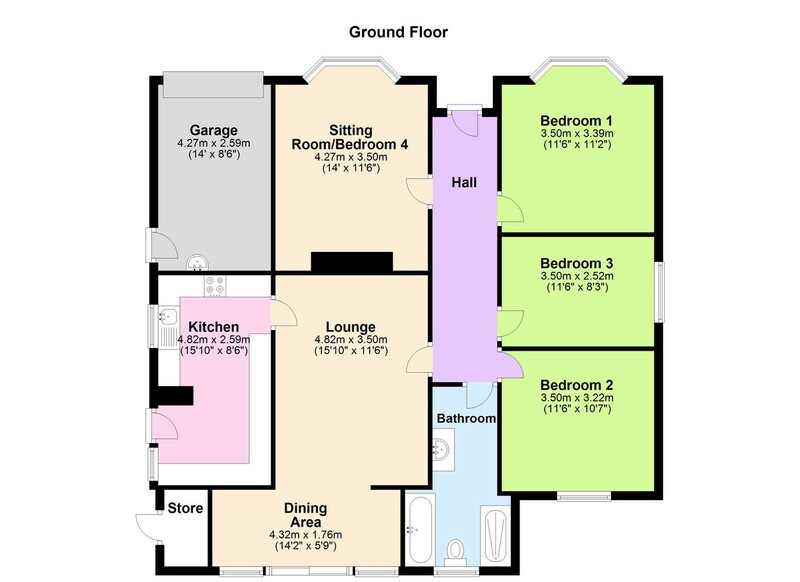 The property benefits from well-proportioned rooms, an excellent layout ideal for modern lifestyles and still offers scope to convert the loft for further accommodation (subject to any necessary planning permission). Also having spacious tiered gardens, off street parking and garage. Viewing of this great home is a must. HALLWAY Composite entrance door, telephone point, a fixed coat cupboard, radiator, doors to the sitting room, bathroom, living/dining room and 3 bedrooms. There is also access to the loft space by a drop down ladder, which houses the boiler pressurised immersion heater and also offers the potential for conversion to further accommodation (subject to any necessary planning permission). SITTING ROOM/BEDROOM 4 14' x 11' 6" (4.27m x 3.51m) uPVC double glazed bay window to the front, radiator, television point, open fire with tiled hearth and surround and cupboards with shelving over onto the alcoves and coving to the ceiling. LIVING/DINING ROOM 15' 10" x 11' 6" (4.83m x 3.51m) Gas fire set into an Inglenook fireplace with wooden surround and marble hearth, recess spotlights, glazed oak door to the Kitchen, television point and is open to the Dining area(14'2" x 5'9") (4.32m x 1.76m) which has sliding patio doors with side panel double glazed windows leading out into the garden. KITCHEN 15' 10" x 8' 6" (4.83m x 2.59m) Matching range of wall and base units with a wooden work surface over and matching upstand, integrated dishwasher and fridge freezer, electric Hotpoint oven and grill, 4 ring Electrolux gas hob with an Elica extractor hood over, space for a washing machine and dryer, radiator, double glazed door and window to the side and a frosted window to side. BEDROOM 1 11' 6" x 11' 2" (3.51m x 3.4m) Double glazed bay window to the front, Sky TV point and a radiator. BEDROOM 2 11' 6" x 10' 7" (3.51m x 3.23m) Double glazed window to the rear, built-in wardrobe with overhead storage, radiator and coving to the ceiling. BEDROOM 3 11' 6" x 8' 3" (3.51m x 2.51m) Double glazed window to the side, radiator and a built-in wardrobe. BATHROOM 4 piece suite comprising of a bath with chrome mixer tap over, walk-in shower with tiled walls and flooring with a glazed screen and fixed and handheld shower heads, washbasin set into a vanity unit with a chrome mixer tap, low level WC. Chrome ladder style heated towel rail, extractor fan, double glazed frosted window to the rear, recess spotlights and tiled flooring and matching skirting. OUTSIDE To the front there is a tarmac driveway with a lawned frontage, mature hedged and fenced boundaries with flower beds and access to the rear at both side of the property. The garden to the rear has 3 tiers and has gated access to the sides of the property. Tier 1 is mainly lawned with steps up to tier 2, attractive stone retaining wall, flower beds and walled and fenced boundaries. There is also a useful coal house for storage. Tier 2 has gated access from tier 1 and is mainly lawned with hedged and fenced boundaries, paved patio area with matching seating and an attractive stone built retaining wall and steps up to tier 3. Tier 3 has hedged boundaries, 2 garden sheds and is mainly lawned and has stunning views over Bedale and towards the Hambleton Hills. GARAGE 14' x 8' 6" (4.27m x 2.59m) Electric roller door, light and power points, window to the side, uPVC door to the side and a washbasin.